Pakistan’s former PM Nawaz Sharif sentenced to seven years prison for corruption. Nawaz taken to Adiala, to be shifted to Kot Lakhpat prison on Tuesday. Only 15 people were allowed in the courtroom including PML-N leaders and lawyers. Media personnel have been asked to carry an ID with them. Only five reporters have been allowed inside the courtroom. An accountability court on Monday sentenced former prime minister Nawaz Sharif to seven years in prison in Al-Azizia Steel Mills corruption reference, while acquitting him in the Flagship Investment reference. Nawaz has also been fined Rs1.5 billion in the Al-Azizia reference. In a short verdict announced today, the court said there was concrete evidence against the former premier in the Al-Azizia reference, and that he was unable to provide a money trail in the case. There was not enough evidence to convict Nawaz in the Flagship reference, thus he has been acquitted, the decision read. The detailed verdict is expected to be announced later today. Accountability Court II Judge Arshad Malik announced the verdict in the corruption references against the Sharif family, after reserving the decision last week. The National Accountability Bureau (NAB) had concluded its final arguments in the Flagship reference against Nawaz on Tuesday – the third and last reference against the PML-N leader. The anti-corruption watchdog had wrapped up its arguments in the Al-Azizia reference earlier this month. On Friday, the court had accepted the request of Nawaz’s counsel to submit additional documents in the Flagship Investment reference and rejected NAB’s reservations. On December 7, the Supreme Court had directed the accountability court to conclude the cases by December 24, after previously granting it seven extensions to wrap up the references initiated by NAB. Security around the Judicial Complex in Islamabad was tightened ahead of the verdict. 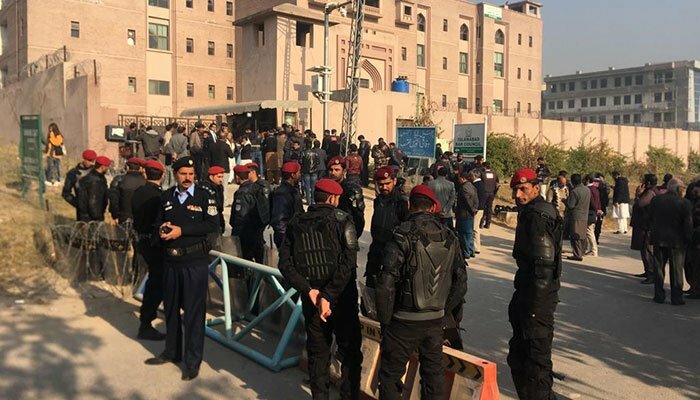 According to Islamabad administration, a thousand police officials and one hundred Rangers have been deployed around the accountability court. All passageways leading to the accountability court have been sealed.